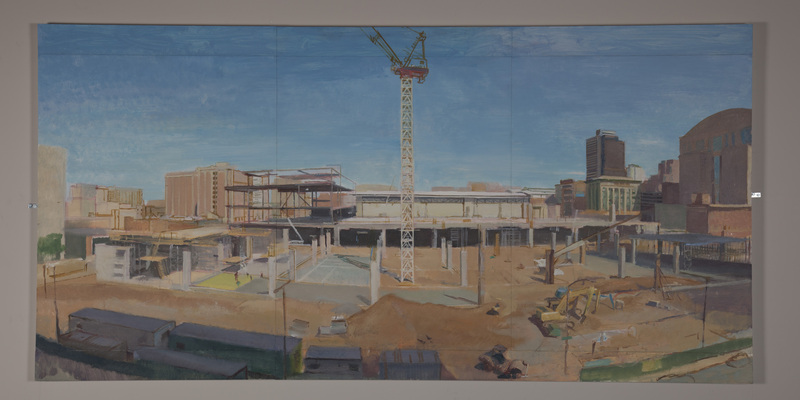 Expanding the Convention Center, and its companion painting the Pennsylvania Convention Center also acquired – Awaiting the Convention Center – were both painted from window views in the Hamilton Building on the west side of Broad Street opposite the Broad Street Atrium entrance to the Convention Center. Expanding the Convention Center was made over eight days in May five years after the first painting, Awaiting the Convention Center. A large crane has appeared where the Gilbert Building once stood and the columns and first floor slab for the Center’s new exhibition halls are unfolding toward Broad Street. Cherry Street is just a memory, a corridor between the new columns while the second floor deck is halfway finished. The wooden forms, which will complete the floor, are being built on the site of the old Firehouse along Race Street. Taken together, both Awaiting the Convention Center and Expanding the Convention Center are core samples of urban geology. They express something about change and growth in a city, but also the qualities that persist: the color and light that connect moments in time.